Through GBMOIM International Conference I had the opportunity to meet and learn from Dr. Georges Berlinson his vision and immense knowledge of Orthopedic Manual Medicine. Currently we are good friends and maintain regular contact to keep learning. Exhaustive exploration always precedes diagnosis and once given it and if required, we proceed to spinal manipulation. In their lectures this one of his his most recurred mottos: “you manipulate with your body movement, hands are only a good positioning anchor”. 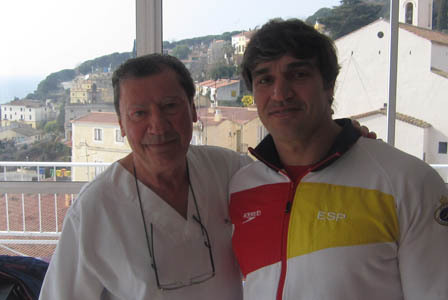 Those who have had the opportunity to share the experiences and lessons of Professor Berlinson can see that the spinal manipulation technique reaches the high degree of mastery that he displays. Dr. Georges Berlinson integrated into the French medical group dedicated to Research Group Manual Therapies. Led by Professor Eric Winter as KINORTESIS –defined as manipulations of Kiné (movement), Ortho (manual) These (action). That is, “therapeutic act that returns to normal movement”. Having studied all the techniques of the Research Group of Manual Therapies, traveled widely to meet diverse training drugs, reaching further and acquiring a vast and diversified knowledge manipulative techniques always looking for a line of reasoning that would allow it to build the gesture handling according to the morphology of the therapist and the patient’s symptoms and stature. As a very active member of the Federation of French and Francophone Manual Medical Education, Dr. Berlinson is in constant contact with all other groups and of course with GBMOIM, giving us all a very valuable tool for teaching which we will always be grateful.